Review by AllTheBestFights.com: 2018-07-07, good finish between Gokhan Saki and Khalil Rountree: it gets three stars (UFC Performance of the Night). The former Glory light-Hw kickboxing champion Gokhan Saki entered this fight with a professional mma record of 1-1-0 (100% finishing rate) but he has kickboxing record of 83-12-0 (59 knockouts) and he is ranked as the No.78 light heavyweight in the world. He debuted in mixed martial arts in 2004 but he lost to James Zikic via tko; then he fought in 2017 beating Henrique da Silva (4-stars fight, Gokhan Saki vs Henrique da Silva). His opponent, Khalil Rountree Jr, has an official record of 6-2-0 (67% ko/tko victory rate – he has never won via submission) and he entered as the No.71 in the same weight class. He suffered two consecutive defeats in 2016, against Andrew Sanchez and Tyson Pedro, but then he has collected two victories, over Daniel Jolly and Paul Craig, and one no-contest with Michał Oleksiejczuk. Saki vs Rountree is on the undercard of Stipe Miocic vs Daniel Cormier – UFC 226. Watch the video and rate this fight! 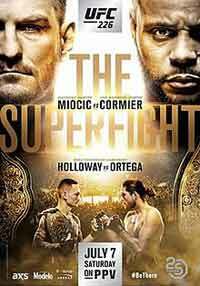 Review by AllTheBestFights.com: 2017-09-23, tough fight with some nice exchanges and a spectacular finish: Gokhan Saki vs Henrique da Silva this is one of the best mma fights of 2017 and it gets four stars (UFC Performance of the Night). The former Glory light-Hw kickboxing champion Gokhan Saki entered this fight with a professional mma record of 0-1-0 but he has kickboxing record of 83-12-0 (59 knockouts). He debuted in mixed martial arts in 2004 but he lost to James Zikic via tko; in his last kickboxing fight he beat Sebastian Ciobanu in 2015 (=Saki vs Ciobanu). His opponent, Henrique da Silva, has a record of 12-3-0 (100% finishing rate) and he entered as the No.78 light heavyweight in the world but he comes off three consecutive losses, two in 2017, against Jordan Johnson and Ion Cutelaba. Gokhan Saki vs Henrique da Silva is on the undercard of Ovince St Preux vs Yushin Okami – UFC Fight Night 117. Watch the video and rate this fight! Review by AllTheBestFights.com: 2015-04-17, pretty good fight between Gokhan Saki and Sebastian Ciobanu: it gets three stars. Gokhan Saki entered this fight with a professional kickboxing record of 81-16-0 (58 knockouts) and he is ranked as the No.1 super cruiserweight in the world. He suffered his last loss in 2013 when he faced #1 heavyweight Rico Verhoeven (=Saki vs Verhoeven) but after this bout he won the Glory light-Hw title beating Tyrone Spong in the final of the tournament (=Spong vs Saki 2). His opponent, Sebastian Ciobanu, has an official record of 27-14-1 (4 knockouts) but he comes off two consecutive defeats, against Vladimir Mineev and Maxim Bolotov. 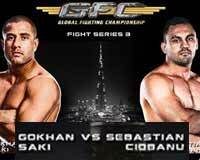 Saki vs Ciobanu is the main event of Global Fighting Championship 3 (GFC-3). Watch the video and rate this fight! Review: 2014-04-12, good start but disappointing finish…Gokhan Saki vs Nathan Corbett can’t get more than two stars. Gokhan Saki entered this fight with a kickboxing record of 79-17-0 (56 knockouts) and he is ranked as the No.2 heavyweight in the world, he fought just twice in 2013 winning the rematch against Daniel Ghita (=Saki vs Ghita 2) but then he lost to Rico Verhoeven via majority decision (semifinal of the Glory Hw tournament: Saki vs Verhoeven). His opponent, Nathan ‘Carnage’ Corbett, has a record of 59-4-0 and he entered as the No.3 super cruiserweight, he fought three times in 2013 losing only to Tyrone Spong (4-stars fight: Spong vs Corbett 2). Saki vs Corbett is the semifinal of the Glory light heavyweight tournament; undercard of Robin van Roosmalen vs Marat Grigorian – Glory 15. Watch the video and rate this fight! Review: 2014-04-12, we hope to see the rematch of this fight…Tyrone Spong vs Gokhan Saki 2 gets two stars. Tyrone Spong entered this fight with a kickboxing record of 74-6-1 (46 knockouts) and he is ranked as the No.1 super cruiserweight in the world while Gokhan Saki, has an official record of of 80-17-0 (57 knockouts) and he is ranked as the No.2 heavyweight. In their first bout, held on March 28th 2009, Saki defeated Spong by ko in the fourth round (at K-1 World GP 2009 in Yokohama). Spong vs Saki 2 is the final of the Glory light heavyweight tournament, in the semifinals Spong defeated Saulo Cavalari while Saki won over Nathan Corbett; undercard of Robin van Roosmalen vs Marat Grigorian – Glory 15. Watch the video and rate this fight! Review: 2013-10-12, close fight with one knockdown: Gokhan Saki vs Rico Verhoeven gets three stars. Gokhan Saki (79-16-0) entered as the No.2 heavyweight in the world while Rico Verhoeven (40-7-1) entered as the No.6. Saki vs Verhoeven is the semifinal of Glory heavyweight world championship tournament; undercard of Tyrone Spong vs Nathan Corbett 2 – Glory 11. Watch the video! Review: 2013-04-06, great fight with three knockdowns: the second fight between Gokhan Saki and Daniel Ghita gets three stars. Gokhan Saki (78-16-0) entered as the No.3 heavyweight in the world while Daniel Ghita (47-8-0) entered as the No.2. In their first fight Saki defeated Ghita (December 11, 2010); Saki vs Ghita 2 is the main event of GLORY 6 Istanbul. Watch the video! Review: 2012-12-31, pretty good fight ended by a controversial decision: Semmy Schilt vs Gokhan Saki gets three stars. Semmy Schilt (41-6-1) entered as the No.3 heavyweight in the world while Gokhan Saki (78-15-0) entered as the No.7. Schilt defeated Rico Verhoeven in the quarterfinal while Saki won against Anderson ‘Braddock’ Silva; Schilt vs Saki is the semifinal of 2012 Glory heavyweight tournament – GLORY 4 Tokyo. Watch the video! Review: 2012-12-31, the fight between Gokhan Saki and Anderson Silva gets three stars thanks to some nice exchanges and good finish. Gokhan Saki ranked as the No.7 heavyweight in the world, entered the fight with a record of 77-15-0 while Anderson ‘Braddock’ Silva had a record of 33-8-1. Saki defeated Raoumaru in the eighth-finals while Silva won against Igor Jurkovic; Saki vs Silva is the quarterfinal of 2012 Glory heavyweight tournament – GLORY 4 Tokyo. Watch the video! Review: 2012-12-31, great first round with two knockdowns: Gokhan Saki vs Raoumaru gets three stars. Gokhan Saki ranked as the No.7 heavyweight in the world, entered the fight with a record of 76-15-0 while Raoumaru had a record of 12-5-0. Saki vs Raoumaru is the eighth-final of 2012 Glory heavyweight tournament – GLORY 4 Tokyo. Watch the video!